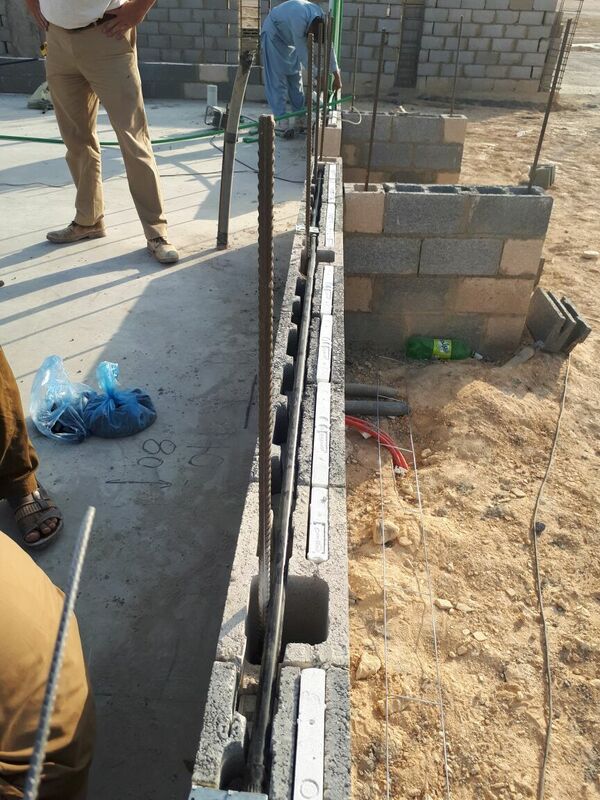 The following photos and text should provide enough information for the reader to understand what is being done to accomplish the specific task or installation. 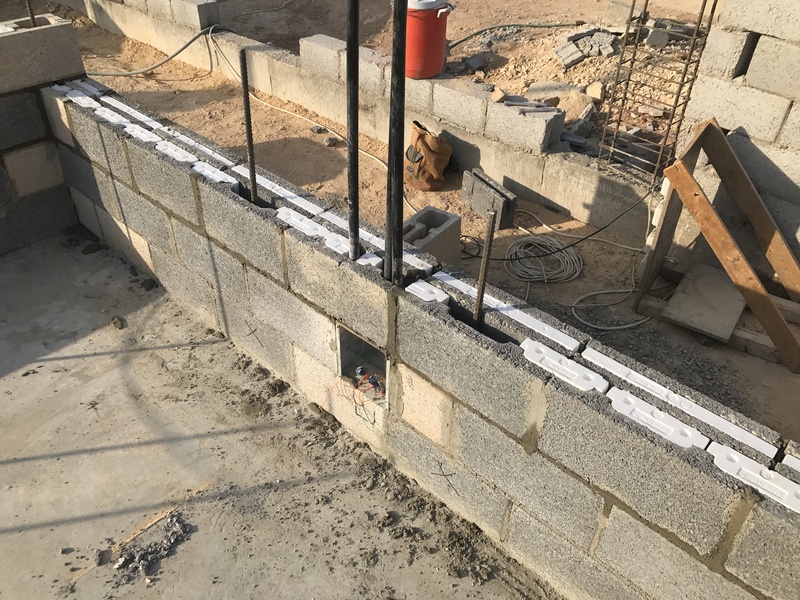 Electrical sleeves are installed in the stem wall underground to provide access to power to the villa. 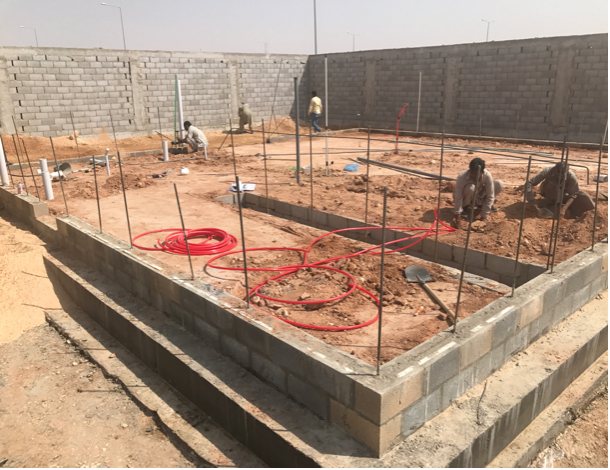 The electricians run the industry standard flexible red conduit to various locations under the slab and stub the conduit up into exterior and interior wall locations. Industry standard electrical boxes with 3/4″ conduit knockouts are used throughout the villa. This is a close-up of the box, adaptors and black PVC rigid conduit all readily available standard electrical parts. A close-up view of the how the box assembly perfectly fits into an Omni Block stretcher block. The block is saw-cut using the box itself as the template. 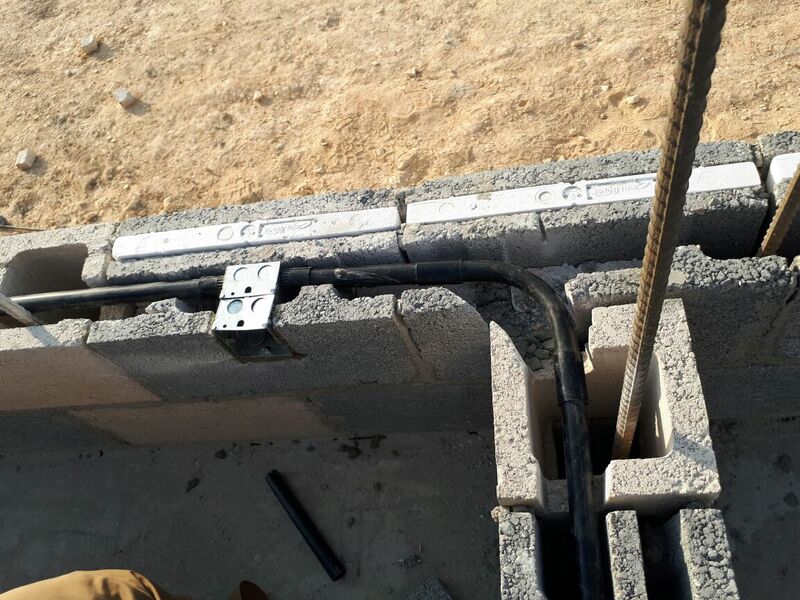 In the second course or 40cm top-of-box the electrical boxes are set and vertical and horizontal conduit is run within the block. 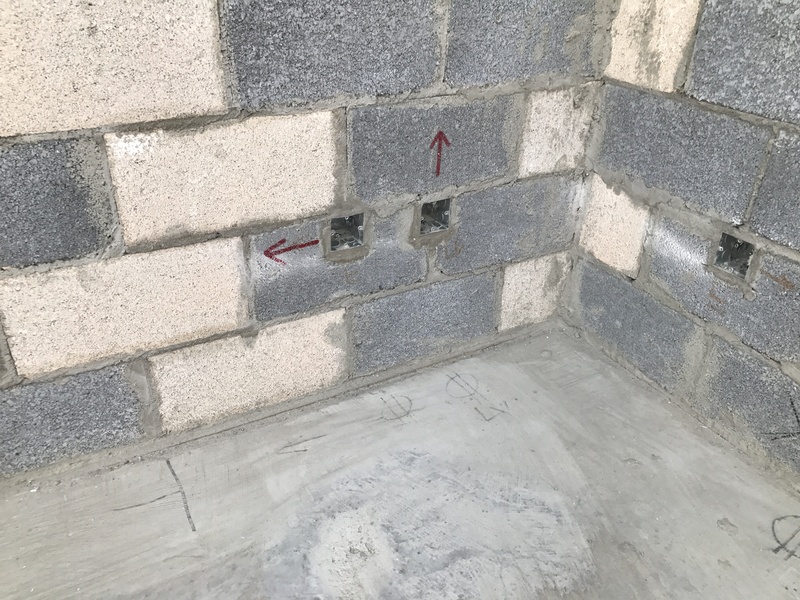 This photo shows that there are two boxes being connected together with the black horizontal conduit. 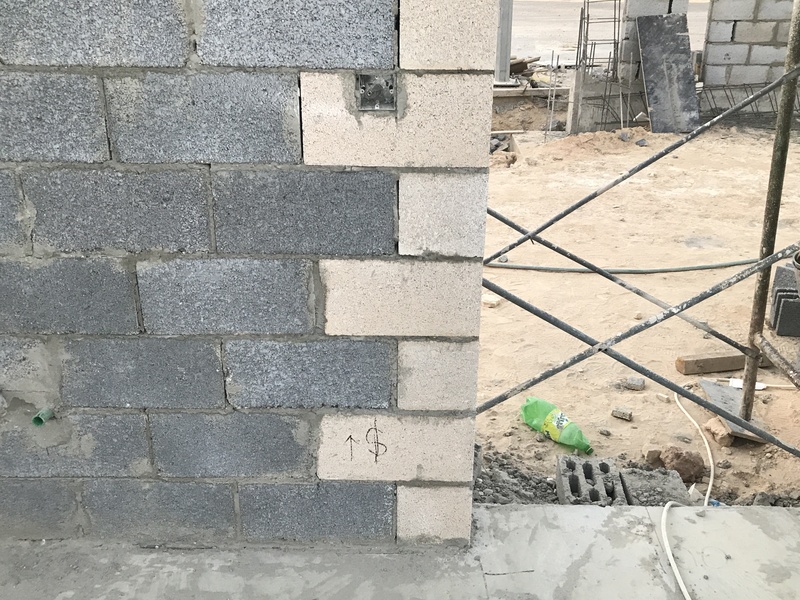 The slab is initially marked for all electrical and low voltage locations (the electrical sign indicates that the top-of-box is to be at 40cm) and which direction the connecting conduit is to be run. 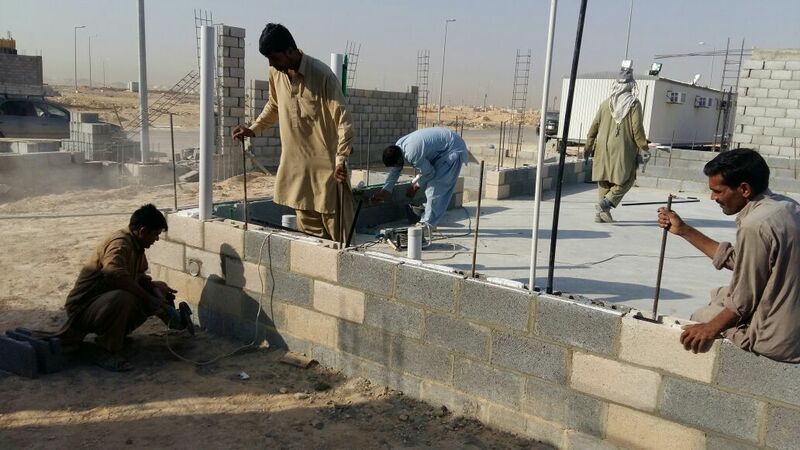 As the second course is laid, the boxes and conduit are installed. The far left box is a high voltage box with its conduit running horizontally to the next box. The middle box is low voltage and its conduit is run vertically. 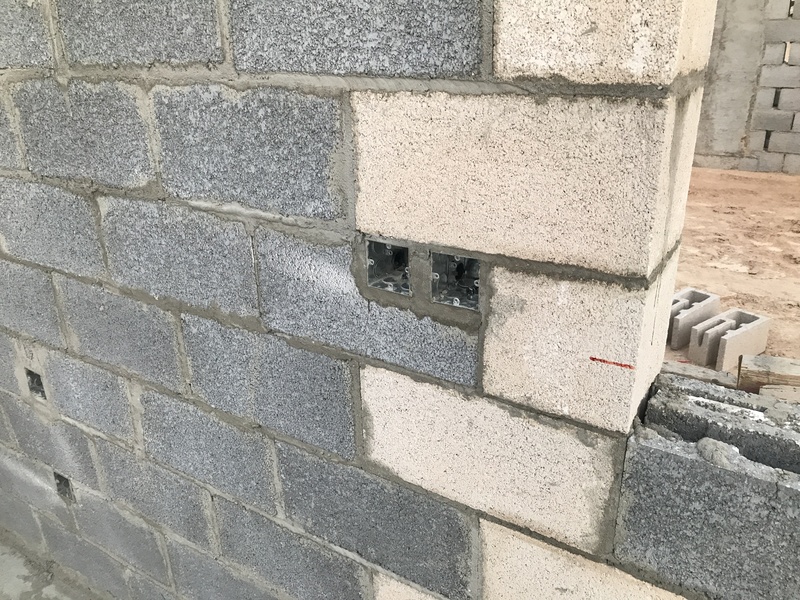 The far right high voltage box on the adjacent wall is installed and its conduit is run horizontally to the right to the next box. 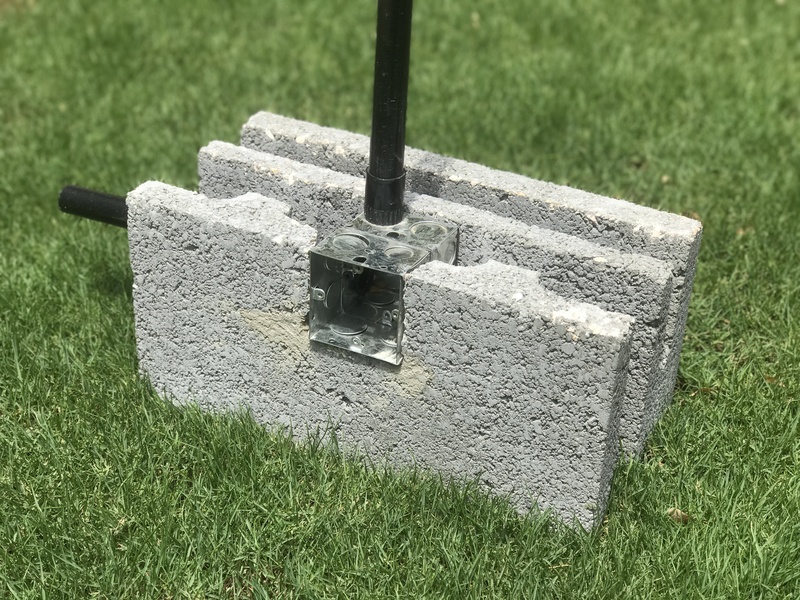 The ability to easily run horizontal conduit is a significant advantage because if the need ever arises to add an additional electrical box, all that is needed to be done is to cut in for the box, tap into the conduit and run additional wiring. No more “chippy-chippy” of the block and no more patching of the chipped block as well. The project supervisor realized that the exterior lighting on the villa was also switched at the entrance gate. The electricians cut in and placed the vertical conduit it the exterior Omni Block cell. The flexibility of running the conduit horizontally is depicted here. Whenever there is a need to run the conduit into the adjacent wall, a 90° sweep is used so that the electricians can “fish” the wiring. 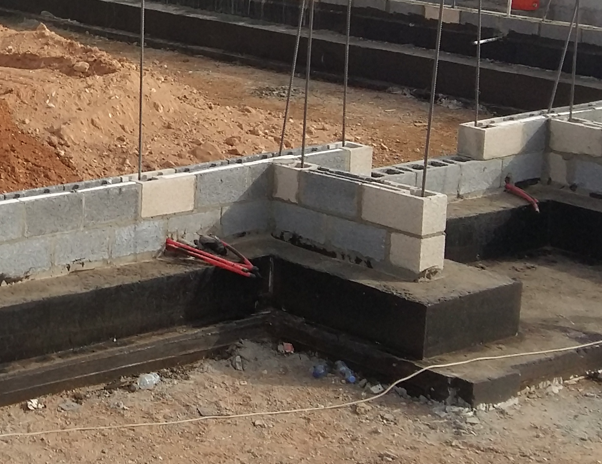 A standard low voltage main box is installed within the block and vertical conduits are run. In this case, the electricians ran an additional one. Switch locations are noted on the wall and are set at the standard 120cm height. This photo illustrates where two outlet box locations occur side-by-side in the kitchen above countertop height. 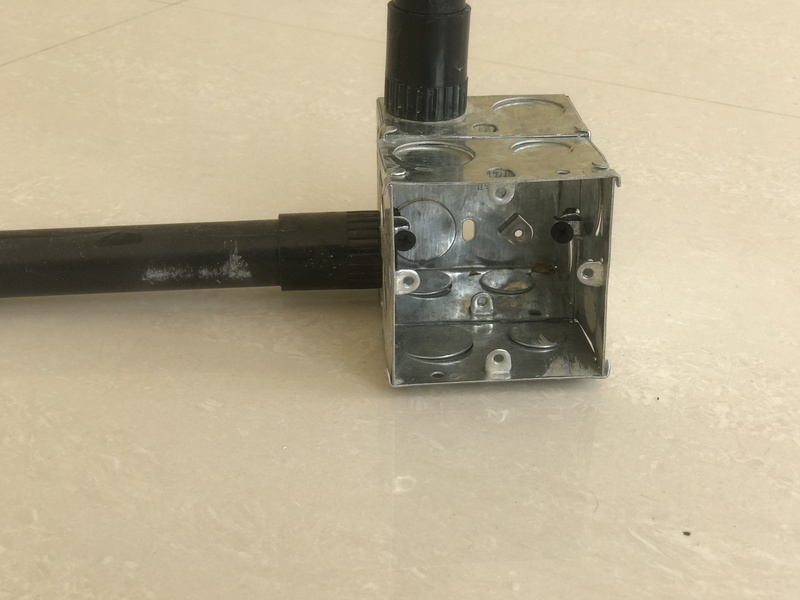 It is recommended in these kitchen situations to run horizontal conduit at the switch height in the event that an additional outlet or switch is ever needed.